Done by Forty: Do It Now! As I have so many unfinished tasks on my to-do list, which seemingly only grows, I am trying a new process. Here is the main idea: if a task on my to-do list comes to mind, I have to work on it right now, regardless of its importance or the current thing I am working on. So that means no walking by dirty dishes in the sink. No avoiding the clean clothes hanging out in the hamper. No telling myself I will work out later tonight. No writing down tasks to be done later. If something comes to mind, it must be addressed on the spot, right now. The catch is that I only have to work on the task for five minutes. If I start a task and I hit the five minute mark, I stop and get back to whatever else I was doing. When I come by that task again, I spend another five minutes on it. (And if I'm close to completing a task after five minutes, I can choose to simply finish it.) This means I'll often be doing something trivial for a while instead of something important. But important tasks will only be delayed by a trivial amount of time, and the majority of the little things on my to-do list can be positively impacted (or maybe entirely completed) within five minutes. This flies in the face of the Covey approach I've tried so many times, and which never sticks for me. I've tried writing down my weekly roles and goals, prioritizing, assigning tasks to each day, and doing the first things first. That works for a few weeks or a month before I settle back into my old routine. Eventually I stop filling out the weekly planner and lose any benefit from the system. The rub is that the Covey process doesn't materialize into a habit for me. The main reason I am taking this approach is to establish a new, positive habit: one that rewards me when I avoid procrastination via small doses of productivity. While I love reading about new approaches and ideas to be more productive or efficient, if the process does not evolve into a habit then I have no chance of leveraging the technique. I'll try it out a few times, get some quick wins, and then probably quit. To break this pattern, the idea is to work hard for a short time when I think of a task, get the positive emotions associated with accomplishment (even a small accomplishment), and then repeat the process throughout the day. 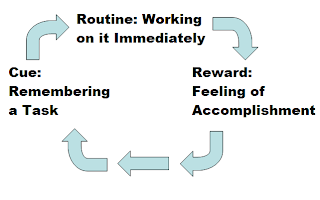 The result I hope to achieve is a positive habit loop, as outlined in the Power of Habit. The main risk is that I'll spend more time working on small errands and home maintenance while neglecting larger tasks like establishing a side hustle or, you know, working at my actual job. But my guess is that the impact is going to be minimal for a couple reasons. For one, I probably already waste enough five minute stretches during the course of a day that there may not really be a net impact on my time. And even if I spend twelve of these five minute periods on small, immediate tasks every day, that only adds up to an hour. The benefit of a new, productive habit that rewards me when I avoid procrastination seems like a worthwhile use of an hour every day. I'm not entirely sure what the end result will be. My tasks will probably be a little more disjointed, switching back and forth between different activities. My days might have more small periods of maintenance than long sustained periods of heads down work. If nothing else, the house will be a little cleaner and I should procrastinate less. Even that would be great: I love a clean house, though I rarely have one. I already feel better for having spent some time to finish this post today, instead of letting it rot on the vine even longer. In time, maybe the habit will spread from avoiding small, five minute activities to avoiding procrastination on larger, important activities. But the first goal is a sustainable habit, so I'll just have to keep track of my actions and report back. I'm terrible at sustaining new activities over the long term, so wish me luck on that front. That's all for now. Thanks, as always, for reading. I just remembered I need to work out, so I'm off to do some push-ups and stretches. *Photo is from Nizaad at Flickr Creative Commons. I do the exact same thing. God help me when I lose a post-it note, too. That's it own to-do on some days...finding the to-do list. I have the same post-it note procrastination method! They're everywhere!! DB40 - Thank you so much for the shout out. I love your new productivity bursts model and look forward to finding out how it works for you. I will of course be running with momentum as well and hopefully creating better habits in the process. Cheers to getting stuff done! Cheers, Emily! And thank you for the inspiration on the method. I'll let you know how it goes. I love that caveat. The objective has to be knocking out small chores that don't take a lot of time but cause a lot of stress, due to procrastination. This sounds like a great idea, keep us posted with how you find it! I have so many little things that get put off because I know I need to work on the bigger stuff. Often I end up thinking about the bigger stuff but not actually getting the bigger stuff done, never mind the small stuff! That's my dilemma, too, Hayley. I ignore the little tasks because I tell myself I'm "working" on bigger things...but often it turns out I'm just procrastinating. I probably have a solid 40 or 50 half written posts in my draft folder. I could really benefit from some more productive habits. My draft folder is the same way, Stefanie. At least this post took that number down one, right? My draft folder is the same way! I think this is a great method. Many of the most successful people I've known have testified to it: when you have to do something, do it. Right then and there. Eventually you end up not needing a list because everything is just done. I sooo procrastinate, I end up working late at night to do things. It takes me forever to get around working on my blog as I would rather read other people's. I have the same pattern. I try to force myself to finish a blog post before going to other blogs to read & comment. I think about too many things for this to work for me. My mind is constantly jumping from idea to idea so I'd be starting a new task every five minutes. I really try to do the most important ideas first but sometimes I fail. I hear you. I'd like to get to that point, but my problem isn't that I'll put off those items too long. The list is no the wrong trajectory in my case. Writing down goals on a daily, weekly, and monthly basis actually has worked quite well for me the past few years. Surprisingly I've stuck with it and almost feel lost at work when I don't have my to-do list marked with priorities. That's rad, DC. That's the place I'd like to get to in time. I'm using a cell phone application on my android for to-do things just like the budgeting application. I'm really trying my best to follow all my scheduled things to do but sometimes it's so hard to follow those. That's cool. What app do you like? I use Evernote for building my grocery or other "to buy" lists, keeping track of travel details, etc. I agree that most writing can't be done in a set time (even five minutes) but I do find that if I start a task, I'm a lot more likely to push through and finish it. That's what happened with this post. Never put off till tomorrow what you can do today. How many times have I heard this line and I thought why does it have to be difficult to stick to doing things on time? Perhaps the hurried world we live in has something to do with it but we definitely have to outsmart that and I am starting with a good, solid plan. Sticking to the plan is another thing. Again, another area of concern. Interesting. I've tried to be better about handling small tasks like you mention immediately as well. I have a tendency to leave a dish to be cleaned for hours at a time, because "I'll get to it later". I think it's better to handle some of those little things immediately. But I also have a tendency to get distracted very easily so on the flip side I've been trying hard to get better at single-tasking for longer periods of time. I'm not very good at it, but the small steps are starting to help. In the end no one system works for everyone and if you can find something that helps you achieve whatever it is you want to achieve, more power to you. You've nailed the dichotomy: little tasks that pile up vs. the larger tasks that require a long period of sustained attention. I'm going to focus on the former for now in the hopes that it somehow helps me deal with both. If I only knock out the little ones, well, that's okay too. I follow the David Allen "method" of GTD - and it works for me. Interrupting myself because my brain popped an idea into my head would drive me nuts. I just add it to my list (I have a good list system for me), and address it after I'm done with what I'm doing. Otherwise, I'd be spastic-ly changing tasks every 5 minutes like my toddler! Good luck, and let us know how it works out for you! I can see how this wouldn't work well for a list maker (and would probably drive them crazy). My pet peeve is when I remember to do something for the fifth time, and remember that I've put it off five previous times. Very interesting approach - I might test it out to do 10 minute chunks (I'm a slow cleaner haha) after work. I've tried to get into the swing of cleaning one part of the house after work so I don't spend a whole day doing it, but haven't been successful. Maybe dividing it into 10 minute intervals might make it more manageable in my head. Let us know how you do! I like the ten minute chunk change: a lot of tasks might not quite fit in the five minute mold. From cleaning a bit yesterday, I found that in five minutes I can get things "good enough", which is fine. It's just going to get dusty or dirty again anyway. Good enough works, you know? This is an interesting concept. I'm no stranger to dirty dishes or laundry that needs to be put away. My boyfriend and I try to divide up the chores for the most part, but when it's really bothering me, why should I wait for him to do it? I'm not sure if this would work for me, though, because when I focus on something I just want to get it all done at once. This way it's complete and I don't have to think about it again. Unfortunately I wrote a lot this weekend and I didn't like any of it, so I have a few drafts collecting dust, too. Ack! Have you read Getting Things Done by David Allen? He proposes a 3-minute rule: if you can finish a task in 3 minutes or less, then do it now! Otherwise, save it for when you are in the right context (place/mindset). I'm interested to see your results from this. I haven't read that book but it sounds pretty similar to this approach. So far, my results have been great. The house is way, way cleaner and more organized than it usually is. Things get put away as I go, sink is always clean, things get a quick dust when I walk by. So far, none of the bigger tasks have suffered and many are being pushed forward (slowly!) by little bursts of activity. I generally just feel better about avoiding the habit of procrastination, too...even if I just work on something for a couple minutes, it's further along than it was before. Thanks, Eva. Yeah, if writing things down to work on later is a possible solution, I'd recommend the free app (or desktop version) of Evernote. It allows a note to be typed out on either your computer or your phone, and it syncs automatically between your devices. It's a great little free tool. I've yet to find the perfect way to be productive but I just keep plugging along which has somewhat worked up until this point. I think getting into habits and routines just kind of automates things which is helpful, like I know every morning I exercise. 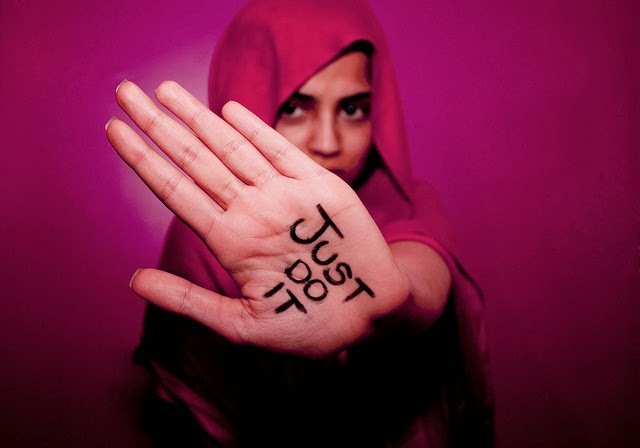 I just do it...it's habit. Good luck and let us know how it goes! Your morning exercise habit sounds awesome and I'm a bit jealous. My only habits on that front are my weekly games of kickball and ultimate frisbee. I never miss those. How long did it take before the action to become automatic for you? Good post DB40, from the looks of the responses, I think you are in good company when it comes to procrastination. Its hard, but I am sure that Hemmingway and Shakespeare both struggled with similar issues and they managed to turn out some productive pieces! Interesting strategy. I feel like this might work really well at home but not at work. I ten to employ this strategy while I'm waiting for stuff. Let's say my oatmeal is warming in the microwave, I'll get as many dishes done and push ups accomplished by the time it finishes. But I like your desire to institutionalize your habit. At work, when I just on the first thing that comes to my mind, I end up spending the whole day on email instead of productive tasks. I think it depends on how many long term productive tasks you're working on. I agree that the system has some hurdles at work. But I have found that by changing my email settings so that no pop up or noise appears when I get an email, I don't find that I think about checking it that often. For me, personally, I do still procrastinate with work tasks I don't want to address. So, for now, I'm finding it helpful to just push forward on those when they appear on my daily calendar (and many of them get surprisingly far on just five hard minutes of work).